Finca Caseta Des Pradi Biel in Lloseta is a holiday home with 1 room. Featuring a private pool and pool views, Finca Caseta Des Pradi Biel is set in Lloseta. This holiday home features a garden as well as free WiFi. The holiday home is fitted with a flat-screen TV. Offering a terrace, this holiday home also has a well-equipped kitchen with a dishwasher, an oven and a microwave, as well as 1 bathroom with a shower. Staff at the 24-hour front desk can provide tips on the area. Palma de Mallorca is 34 km from the holiday home, while Alcudia is 30 km from the property.... The nearest airport is Palma de Mallorca Airport, 40 km from Finca Caseta Des Pradi Biel. Featuring a private pool and pool views, Finca Caseta Des Pradi Biel is set in Lloseta. This holiday home features a garden as well as free WiFi. The ...holiday home is fitted with a flat-screen TV. Offering a terrace, this holiday home also has a well-equipped kitchen with a dishwasher, an oven and a microwave, as well as 1 bathroom with a shower. Staff at the 24-hour front desk can provide tips on the area. Palma de Mallorca is 34 km from the holiday home, while Alcudia is 30 km from the property. 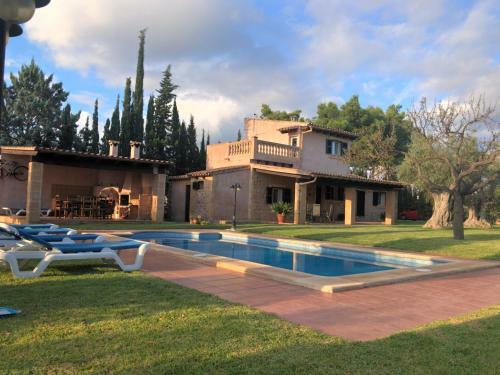 The nearest airport is Palma de Mallorca Airport, 40 km from Finca Caseta Des Pradi Biel. When would you like to stay at Finca Caseta Des Pradi Biel? Children and extra beds All children under 2 years stay free of charge for children's cots/cribs. All children under 12 years stay free of charge for extra beds. All further older children or adults stay free of charge for extra beds. The maximum number of extra beds in a room is 1. Supplements are not calculated automatically in the total costs and will have to be paid for separately when checking out. Any type of extra bed or child's cot/crib is upon request and needs to be confirmed by the innkeeper. This property will not accommodate hen, stag or similar parties. Please inform Finca Caseta Des Pradi Biel in advance of your expected arrival time. You can use the Special Requests box when booking, or contact the property directly with the contact details provided in your confirmation. A damage deposit of EUR 200 is required on arrival. This will be collected as a cash payment. You should be reimbursed on check-out. Your deposit will be refunded in full in cash, subject to an inspection of the property. Electricity is charged at 0.25euros/ per Kw.